In the business world, it’s the age-old question: Why does my business or product need new or re-imagined branding? It’s a question I hear and respond to on a near daily basis. For some the answer is “you don’t.” But for the inquiring minds, the need for strong and consistent branding is imperative to the growth and – ultimately – profitability of the brand, organization, or product. Look for an agency committed to consistency. We’re often blue in the face when talking about the importance of brand design, brand messaging, and other brand creative to be consistent across all touchpoints and appeal to potential clients, customer, donors, and supports at all interactions with the brand. At Proof, each client has a unique process, timeline, and steps to build a successful brand. However, our process is an important step to start each client project. It’s not just a logo and website design that makes your brand stand out. It’s the sum of all the parts: the brand copy and messaging, the print and digital design, the product packaging, and the environmental design (for our brick and mortar clients) that make up a comprehensive brand and brand experience that is sure to be consistent and effective for all that have any interaction with the brand. 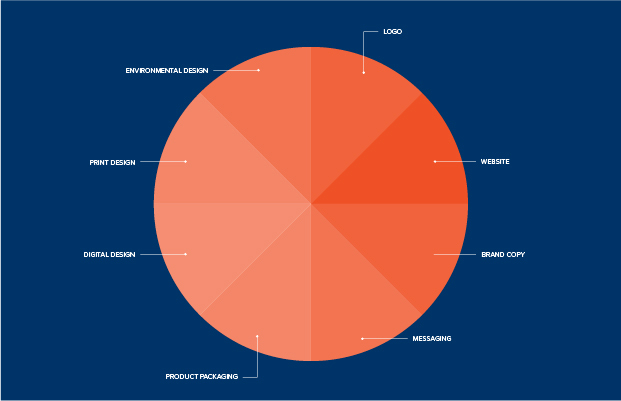 Regularly, we have requests for logo design, website design, print creative, and event collateral, but if all things need to work together in unison, our branding process is to ensure that every client’s brand is built to a place that will set them up for success currently and for the long term. Our bit of advice: Hire a branding agency that takes all of the brand elements into consideration and works with you to build something that’s memorable and most importantly, consistent at every touchpoint and interaction.